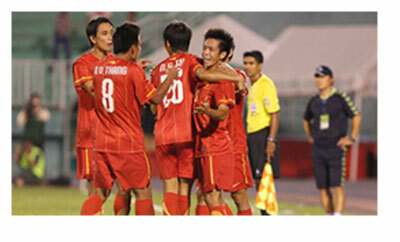 VietNamNet Bridge – South Korea's U23 team held Viet Nam to a 1-1 draw in their final match to earn the single point they needed to win the Viet Nam Football Federation Cup. The South Koreans lifted the trophy at the Thong Nhat Stadium, HCM City, and received prize money of US$20,000 after having claiming seven points from their three matches. Turkmenistan came second with six points from their two wins and pocketed $10,000, while Viet Nam was third with four points from a win and a draw, earning $5,000. South Korea's U23 team captain Kim Bong-Rae opened the scoring with a 40th minute penalty kick, before Nguyen Van Quyet equalised for Viet Nam with a stunning free kick early in the second half. The match was played at a high tempo throughout but South Korea's team had the first real chance of the match when a through-ball released Kong Min-Huyn in the 13th minute, but his hesitancy allowed a Vietnamese defender to intervene. Four minutes later, South Korea's Han Seung-Yeop missed an excellent opportunity when he failed to beat Duong Hong Son in a one-on-one situation. Viet Nam also had their chances. In the 20th minute, Nguyen Trong Hoang managed to poke the ball past South Korea's goalkeeper Hwang Sung-Hyun but his shot was cleared off the goal line. The South Koreans finally broke the deadlock from the penalty spot five minutes before the interval. Viet Nam played better in the second half, putting South Korea under huge pressure and their efforts were rewarded with an equaliser as Quyet slotted home a free kick from the left wing. Speaking after the match, Viet Nam coach Phan Thanh Hung said: "Defence in general and goalkeeping in particular worries me most after this tournament and we hope to overcome these hurdles before the Southeast Asian football championship." South Korea's head coach Ha Sung-Jun said: "I was impressed by the way the Vietnamese players performed today and I believe Viet Nam will achieve development as we have."